Website is very much essential for a digital person. We are the students of a digital university which is Daffodil International University. This is the only one university in Bangladesh who have a very resourceful website and the work of university are done by the help of the website. As a students of DIU, we must have a website. We are students. So, it is difficult to get a website by money. But we need a website. So, whats the solution? Get a free subdomain website which can help you to represents your boss and also carry your CV and all information about you. You can easily reflect you to others without any kind of cost. Here the process is posted for the purpose of helping my DIU family members to get a website without cost. There are lots of websites who gives peoples to get a free subdomain website without cost. Jimdo.com is one of them. This site is very good and easy to create a website. 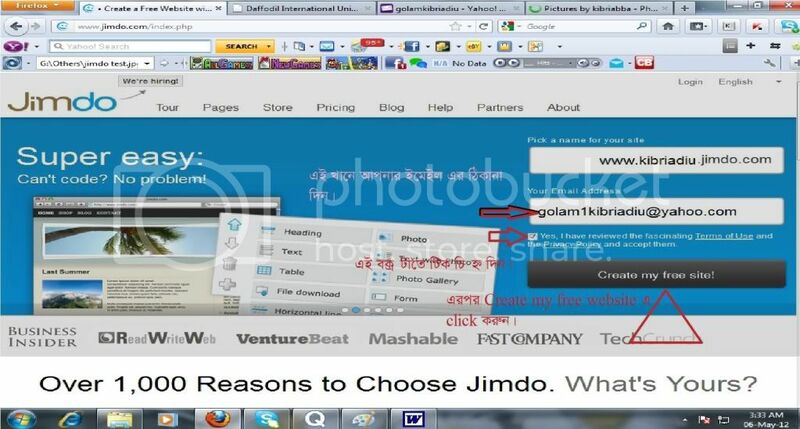 For that, i used jimdo.com to create my website. In this step you go to your mail and check your mail for confirmation and to know the id and password to login into your account to develop your website. I request to every student of Daffodil International University to create a free website from here. Because if all students of DIU get a website, it will be a record in our country. It can helps us to get a very good image in job market. So, do not waste time, get a website. Here i discussed about jimdo. But there are some other websites who provide free subdomain website facility to their users. Here the main steps discussed. If anybody want to learn how to develop your site very well, please practice it. And if anybody face any problem please contact with me.